During the weekend while we were pretending to be Dr Livingstone and searching for the source of the Severn we stayed at a small and quiet caravan site at Disserth, right under a delightful old church. It is dedicated to St. Cewydd, who is said to have been one of the many saintly sons of Caw of Prydyn, a Pictish king in the Strathclyde area of modern Scotland. With the rest of his family, he would have moved south to Edeirnion in Wales, around the early 6th century. However, the evidence for this family relationship is mostly based on the unreliable Iolo MSS and must therefore be treated as highly suspect. 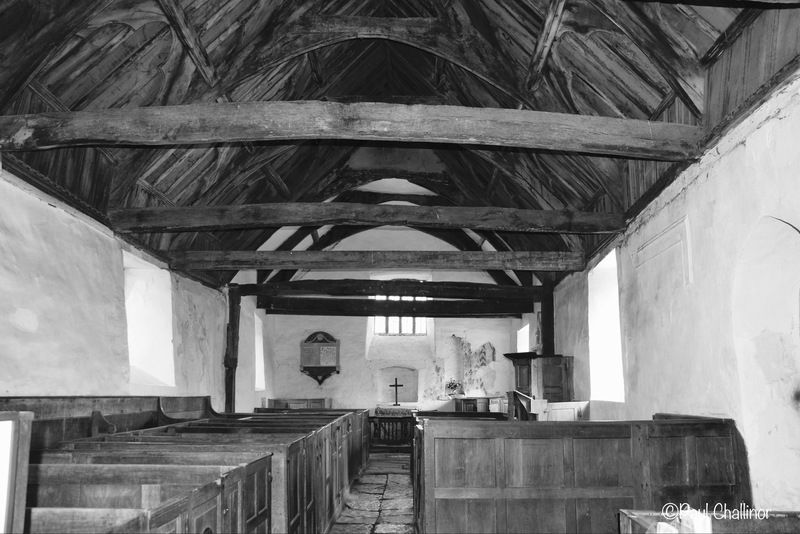 Traditionally, Cewydd became a monk in St. Cadog’s monastery at Llancarfan (Morgannwg) and places in South Wales named after him may date from this time spent in the area. 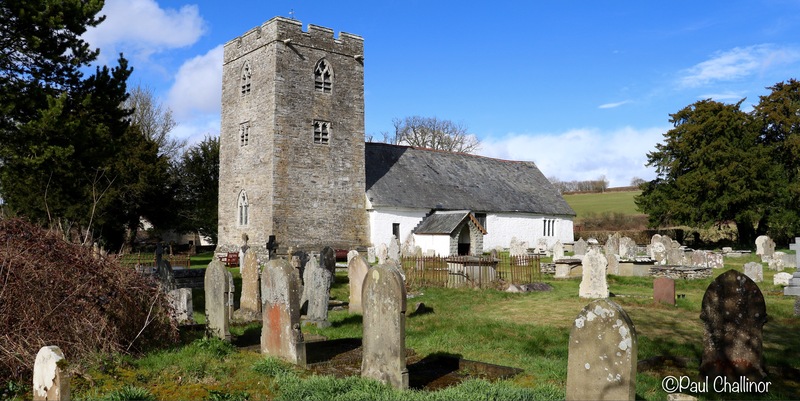 Llangewydd, near Bridgend, has lost its original church dedicated to him, now only traceable in the fieldname, Caer Hen Eglwys. Lancaut near Chepstow is also probably named for Cewydd; along with Cusop, near Hay-on-Wye, and the extinct Capel Cawey in Monachlog Ddu (Pembrokes). Perhaps he also took evangelical trips to Somerset, where Kewstoke is believed to derive its name from Cewydd. Elsewhere, place-name evidence shows that Cewydd eventually settled in Elfael (Radnorshire) where he made a number of foundations. The churches of Aberedw and Disserth are both dedicated to him. Cewydd’s Retreat, Cil Cewydd, appears in the adjoining parish of Llanfihangel Bryn Pabuan and his hill-slope, Rhiw Gewydd, is a mountain track above Llandilo Graban, possibly leading to his brother Meilig’s home in Llowes. He probably died in this region on a date variously said to have been on 1st, 2nd or 15th July. The latter appears to have been the most widely accepted. 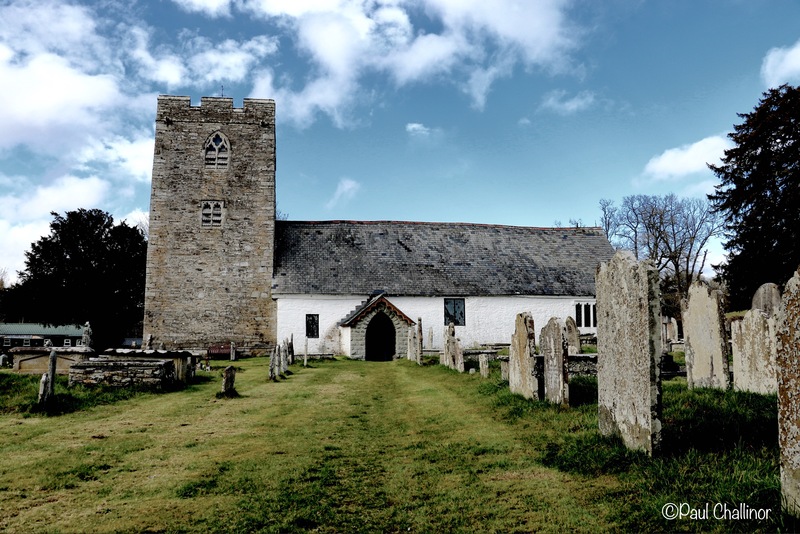 All three dates also have close associations with Cewydd’s English equivalent, St. Swithun. Both were the ‘Rain-Saints’ of their respective nations and it seems likely that these particular days were originally pagan Celtic festivals, of some kind, related to the weather. It is popularly said that if it rains on St. Cewydd’s day, it will rain for forty days and forty nights! But this is Wales and so this will always happen every year at least once. Rain is what we do well here. St Cewydd established the first church here in Disserth, but in reality there is little to support or dispute this claim based on how long ago this occurred. This may be supported by the name Disserth, which derives from the Latin “desertum”, indicating a wild and secluded spot, which can be applied to a hermit’s cell or retreat. But the church is certainly old, and one of the few that has not been “improved” by the Victorians. It is thought that the main church belongs to the 13th century, with the font dating to the 14th. 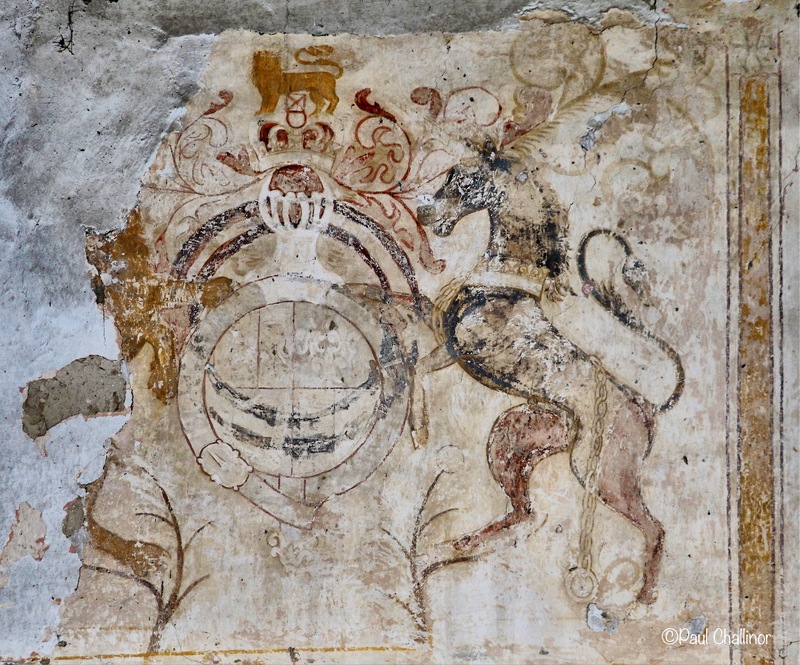 The church was reroofed in the 16th C with some additions and minor alterations in the 18thC. Probably the windows.What is truly fascinating is that the pews are still present, enscribed with the family initials and date of installation. The earliest I could find was dated 1666. The parish records contain some interesting accounts of the parishioners and their habits. 1694 Betty Jones was “presented” before the congregation for “shoving straw up her neighbour’s nose during divine service”. Perhaps sermons have always been boring, and the record doesn’t tell if the neighbour was sleeping or if they were both messing about. Nothing really changes. I remember being very bored in chapel at times when I was young and desperate to be outside aging.– luckily there was no straw available in my days! Another story concerns the need for exorcism. And every church needs an exorcism. In the nearby town of Trecoed lived a tanner, Charles Lewis. He was known for his dishonesty and double dealing. He was reputed to have two scales, one giving double weights when he was buying and one short weights when selling. When he died no one grieved, but he came back and his spirit molested travellers after dark. The local parson, Jones summoned the ghost to meet him at Disserth Church, and there with three other parsons they faced the spirit. Soon three of the parsons fled the church in fear. But eventually Parson Jones emergent triumphant with the evil spirit trapped in a snuff box which was pushed down into a local bog. 100 and 1 things to do with a snuff box. No there’s a title for a TV show! Not all the priests were heroes though. Kilvert, in his diary, gives an amusing account of a victor from the 1860’s. “He would get up to the pulpit without an idea about what he was going to say, and would begin this: ‘Ha yes, here we are. And it is a fine day. I congratulate up on he fine day, and glad to see so many of you here. Yes indeed. Ha, yes, very well. Now then I shall take for my text…..yes let’s see. You are all sinners and so am I. Yes indeed’.” I wonder if there were any Betty Jones’ and straw around? In most villages there is a Church and a compliment of houses surrounding it. Not so in Disserth. There is a Church, yes, but no houses only a farm. This is because Wales didn’t have villages following the English plan. Parishes were large, and house and far,s were scattered around the parish. The nearest village was about a mile away, but the parish church remained isolated but central to the parish in Disserth. That said this is probably why there are so many ancient unspoilt and original churches scattered about Wales. So as I sit here outside the church wall the birds sing their hearts out. A song thrush repeats it’s refrain loudly in a tree near by, a wren completes it song with a trill and a flourish, the blackbird nearby sings it’s unchained melody. It’s almost lulling me in a period of quiet contemplation – but I’m not good at reflection and decide on another cup of tea instead.